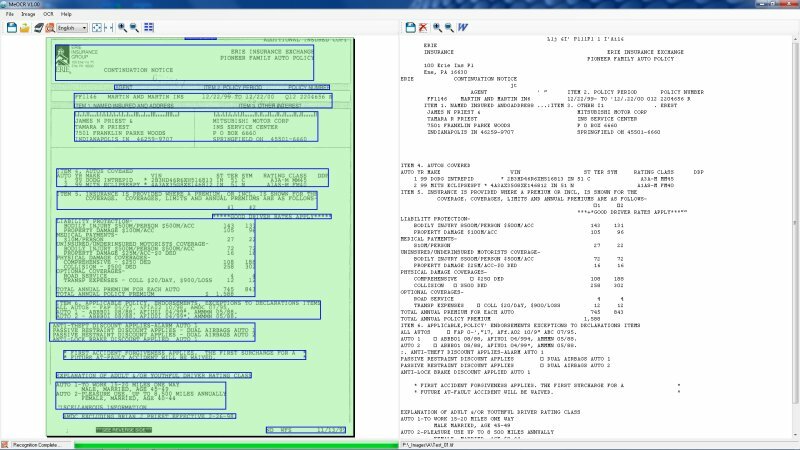 MeOCR 1.0 converts your scanned documents to editable text documents using OCR and exports them to Microsoft Word with one click. Use it to save time and money by not having to retype your documents. Me OCR is a fast reliable and accurate image to text OCR conversion application. Download and start using MeOCR today. MeOCRLib 1.0 is the PUMA OCR Engine .NET API for implemeting OCR capability into your apps. It is easy to use. Sample applications in C# and VB.NET are provided. Write a fully functional OCR applications in just a few lines of code. Click here to view API documentation and sample code. High accuracy: Saves time by reducing the number of corrections and editing needed. Retains Formatting: Most OCR applications do not retain formatting. Me OCR Produces formatted output saving time formatting. Supports Multiple Languages: Bulgarian, Croatian, Czech, Danish, Dutch, English, Estonian, French, German, Hungarian, Italian, Latvian, Lithuanian, Polish, Portuguese, Romanian, Russian, Serbian, Slovenian, Spanish, Swedish, Turkish, Ukrainian. Scan images or load them from file: Scan your images into MeOCR or load them from file. Supports multiples image formats: Me OCR supports all the major file formats. bmp, tiff, jpeg, gif, png. Supports color, grayscale and B/W: Me OCR can recognize text on most images even in color. Image Clip OCR: OCR only a portion of the image by selecting the region with the mouse. TWAIN Scanning Support: Allows importing images from any twain device including cameras. MS Word support: Export document to Word for easy editing and formatting. Save images to multiple formats: Save images as bmp, tiff, jpeg, gif, png. Built in text editor: Allows you to edit your document within Me OCR.